Edit: I would certainly recommend Minos Logger, as it is much easier to use than SDV, has a vastly improved GUI and is free and open source. Dave (G7UVW) and I often operate in the UKAC VHF and UHF contests as G3XBF/p from the Tawney Farm Caravan. I typically use an Apple MacBook Pro or a Netbook running Linux, but prefer to use SDV Log by EI5DI, a Windows console program, to log with. It is important to note here that SDV log is not a DOS program but a Win32 application. 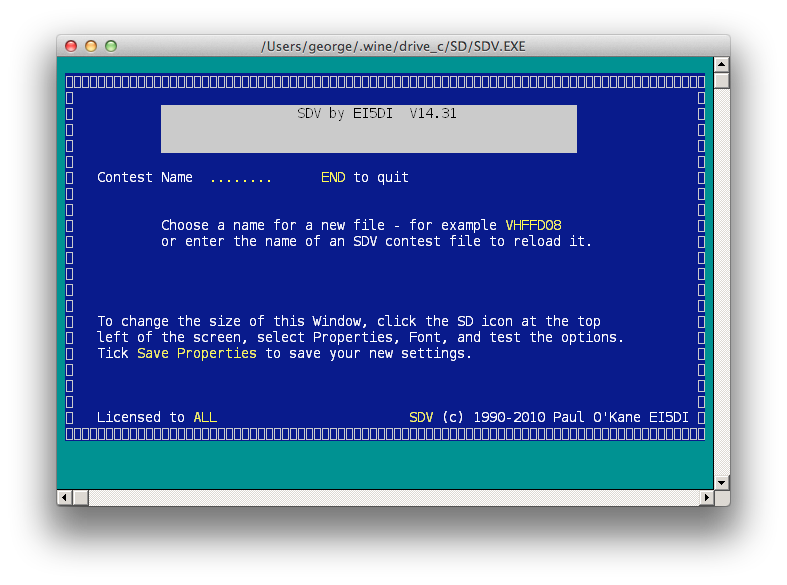 It is a Windows program and will not run in DOSBox for example. 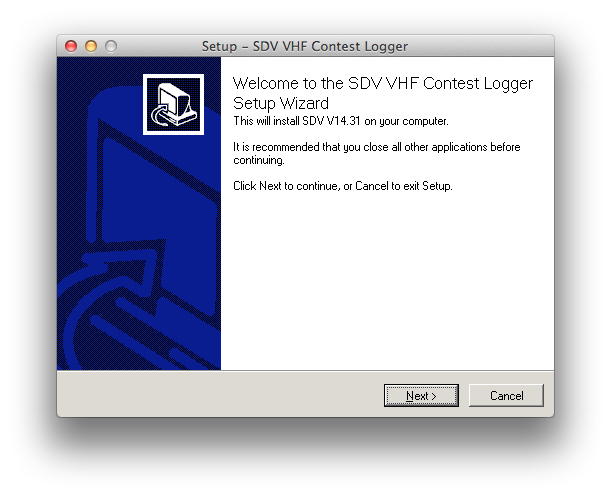 SDV is the free VHF version of SD Log. Fortunately the Wine project comes to our rescue. Wine is a compatibility layer capable of running Windows applications on several POSIX-compliant operating systems, such as Linux, Mac OSX, & BSD. The first thing I did was download SDV from EI5DI’s website. Next you need to download Wine for OS X. I downloaded Darwine from Sourceforge. Install this from the DMG image as a standard OS X application. Once Wine is installed, you can run sdvsetup.exe from within OS X graphical environment. The installer is a graphical program so the standard wine program will work, which is invoked when you click on the installer. Once it’s installed, you will notice that clicking on the icon doesn’t start the program – or at least it doesn’t appear to. That’s because the actual logging software is a console program, and there is special variation of Wine called wineconsole for this. If you installed everything (Wine and SDV) to their default locations, the following should work in your terminal. The wineconsole application resides in the Applications > Wine.app folder. SDV installs to C:\SD (which translates to .wine/drive_C/SD from your home directory for Wine). From here on, it’s business as usual!